At the American Academy of Neurology 70th Annual meeting in Los Angeles on April 25, it was reported that the drug edasalonexent showed a remarkably favorable impact on the progression of Duchenne muscular dystrophy in 4- to 7-year-old boys (“MoveDMD trial”). This study made use of MRI methods developed by Krista Vandenborne, P.T., Ph.D., a professor and chair of the Department of Physical Therapy in the College of Public Health and Health Professions. Dr. Vandenborne’s program of clinical trials has become a magnet for studies of DMD nationally and internationally; the results of this research, which represent a potential breakthrough in the treatment of this devastating disease, were largely based on data that were collected on DMD patients who traveled to UF or one of its satellite sites to participate in the study. This edition of On the Same Page tells a story that travels from Belgium to the University of Pennsylvania to the University of Florida. It blends clinical training with science and, as is true for most of us, takes turns that are influenced by personal relationships and marriage. This is also a story of focus, persistence and dedication to research that can make a difference in the lives of children afflicted with DMD: a step-by-step, methodical approach that Dr. Vandenborne employed to develop a technique that can measure the earliest changes in muscle, before the devastating effects of the disease make intervention too late to have an effect. Over the course of many years, she refined and validated her technique such that it is now the gold standard in studies of this disease and therefore has resulted in UF becoming a destination for patients with DMD and their families. First, some background on DMD, the most common form of muscular dystrophy in childhood. DMD is a severe degenerative, progressive muscle disease that begins with developmental delay in activities such as walking and climbing stairs after the first one to two years of life. It occurs in boys due to a mutation of a gene on the short arm of the X chromosome that encodes for the protein dystrophin. There is eventually a loss of independent ambulation by early adolescence, progressive limitation in upper limb mobility, and development of scoliosis and joint contractures. Eventually, the impact on heart and respiratory muscles leads to pulmonary insufficiency and cardiomyopathy. Death usually occurs by the third or fourth decade of life due to cardiorespiratory complications. In studies of potential drugs to treat DMD, the classic outcome metric was muscle strength and, more recently, the six-minute walk test. The problem with these measures is that clinical progression cannot be detected until about age 7 or older, and the measures are highly dependent on motivation, which is difficult to control in young children. Therefore, trials were typically conducted on older children who had already suffered years of progressive deterioration, with little viable muscle left to treat. In addition, clinical trials often were unable to attract sufficient numbers of patients to create a statistically informative sample. The resulting inconclusive data led to understandable frustration among all parties: patients, parents, industry and the Food and Drug Administration, or FDA. What was needed, therefore, was a sensitive, objective measure that could detect early changes in muscle pathology, even in the absence of significant clinical change. Enter Dr. Vandenborne and her technique of quantitative MR muscle imaging. While MRI cannot directly measure dystrophin, the underlying cause of DMD, it is remarkably sensitive to a number of pathophysiological features that are key characteristics of disease progression in DMD. What has come to be known as “MRI T2” can detect muscle damage and inflammation in dystrophic muscles in the early stages of the disease. As boys get older, muscles are progressively replaced by intramuscular fat, as shown in the MRI in Figure 1 above (normal control on the left and patient with DMD on the right). Eventually, progression of the muscle disease reaches a point where only fat remains. Using spectroscopy and other specialized methods that accurately measure the fat fraction in the muscle from the MRI images, Dr. Vandenborne developed a robust biomarker to assess the disease trajectory in this patient population (see Figure 1, right graph). Based on these data, it is clear that the best time for intervention is before age 7, since progression of disease accelerates exponentially, not plateauing until about ages 16 to 18. Such measures of disease trajectory developed by Dr. Vandenborne are now used in a number of clinical trials in DMD and are being considered by the FDA as acceptable markers for accelerated drug approval, potentially providing patients access to therapeutic drugs years before deterioration accelerates. The process of developing and validating new biomarkers to the point they can be used as endpoints in clinical trials was a lengthy and laborious one, as Dr. Vandenborne started this journey in 1998. The seed was planted when Vandenborne received a small grant ($25K) from the Muscular Dystrophy Association that focused on gene therapy in neuromuscular disorders, while Dr. Glenn Walter, her husband, was a postdoctoral fellow in Lee Sweeney’s laboratory at the University of Pennsylvania. A few years earlier, Dr. Vandenborne had joined the laboratory of Dr. Britton Chance after completing her clinical training as a physical therapist at the Free University of Brussels. She was fortunate to receive a fellowship from the Belgian American Educational Foundation, a philanthropic organization established by President Hoover after World War I in support of the exchange of university students and scholars between the U.S. and Belgium. Since that 1998 grant, Drs. Vandenborne, Walter and Sweeney have collaborated to move imaging biomarkers from animal to human studies and ultimately into large international clinical trials. In early work, they showed that MRI T2 can detect muscle damage and inflammation in dystrophic animal models, as confirmed by the uptake of histological markers. Subsequent gene therapy studies provided the proof of principle that quantitative MRI can track the restoration of skeletal muscle integrity in response to an effective treatment, at least in animal models. Then in 2001, Dr. Vandenborne joined the University of Florida as a faculty member and chair of the Department of Physical Therapy and started moving the MRI strategies into human studies, with a focus on examining pathophysiology and disease progression in patients with DMD. The UF AMRIS facility, with access to both high field animal and human magnets, proved to be the perfect place for this translational program. Building upon the work at UF, Dr. Vandenborne and colleagues received a $7.4 million grant from NIH in 2010 to develop a multicenter natural history study (“ImagingDMD”) to further validate the potential of MR imaging and spectroscopy as biomarkers in DMD and their potential use in clinical trials. A series of papers were published from these data, describing the disease variability across muscles and establishing the link between progression in MR biomarkers and loss of function. A paper published in Neurology, demonstrating the ability of T2 MRI to detect the effect of corticosteroids in young boys with DMD within three months of initiation, provided the crucial piece of evidence to establish MRI as a valuable biomarker in patients. Today, the ImagingDMD clinical trial network, directed by Dr. Vandenborne, consists of 20 expert imaging sites across the U.S. and Europe. Indeed, the ImagingDMD study has grown into one of the most comprehensive natural history studies in DMD and serves as a national resource for the DMD community nationally and internationally. Let us now return to edasalonextent and the results of the MoveDMD trial reported by Dr. Vandenborne and her colleagues (including Dr. Lee Sweeney). Remember that the gene affected in DMD encodes for dystrophin; the mutation in this gene results in a loss of dystrophin, which results in injured muscle fibers and activation of NF-κB (nuclear factor kappa-light-chain-enhancer of activated B cells), a protein complex that controls transcription of DNA, cytokine production and cell survival. This activation of NF-κB, in turn, leads to promotion of inflammation and fibrosis, suppression of muscle regeneration and promotion of muscle degeneration. 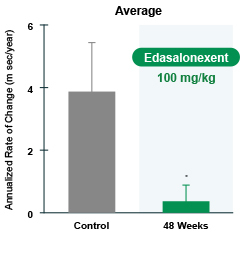 Edasalonextent is an oral small molecule that inhibits NF-κB and therefore holds the potential to mitigate or stall the process by which the loss of dystrophin leads to muscle inflammation, fibrosis and degeneration. In the MoveDMD trial, 17 boys with DMD, ages 4-7, were randomized to edasalonextent or placebo for 12 weeks. After the 12-week trial was completed, a nonrandomized, open-label phase of drug treatment continued for a total of 48 weeks. MRI results were as shown in Figure 2. The increase in MRI T2, the biomarker of muscle pathology in DMD, occurred at about one-eighth the rate in patients during the edasalonextent treatment period compared with the rate of change before treatment. Deterioration in clinical assessments noted prior to the study in measures such as ambulatory mobility, time to stand and the 10-meter walk also appeared to stabilize while on edasalonextent. Any amelioration of disease pathology at this young age has the potential to change the long-term disease trajectory and improve the outlook of children born with a devastating, rapidly progressing muscle disease. As to the future of imaging, given its potential to accelerate the readout of drug therapies, pharmaceutical companies worldwide are incorporating MRI outcome measures into their drug development programs. With four large trials underway, the UF team is hoping to expand its network to include imaging sites in Asia and Australia serving children worldwide. Benjamin Franklin said, “Energy and persistence conquer all things.” With a journey that started some 20 years ago, Dr. Vandenborne’s energy and persistence have resulted in methods that facilitate the conduct and analysis of DMD studies that may result in the approval of drugs that can dramatically change the course of this dreaded disease. In her work, she has embodied the arc of research that makes a difference: from discovery to patients to populations.